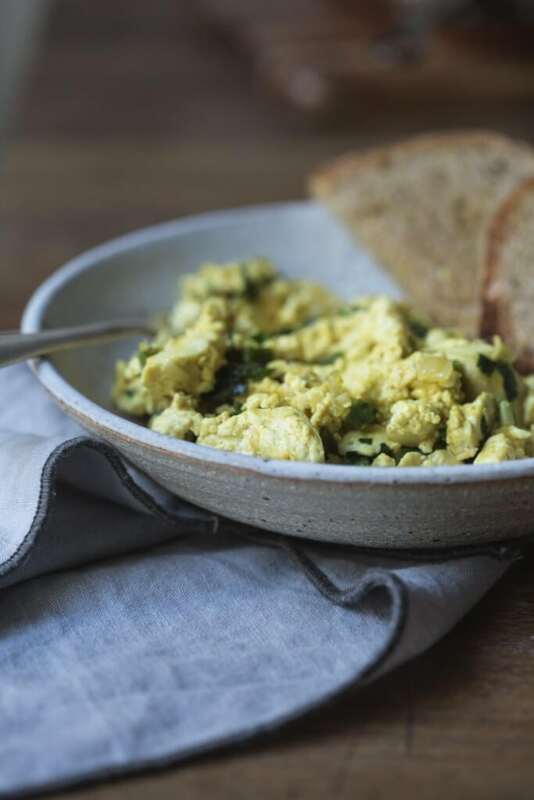 While I’ve made scrambled tofu one hundred different ways, this gorgeously soft, lightly spiced version, inspired by the clever cooks at Smith & Daughters, is hard to beat. 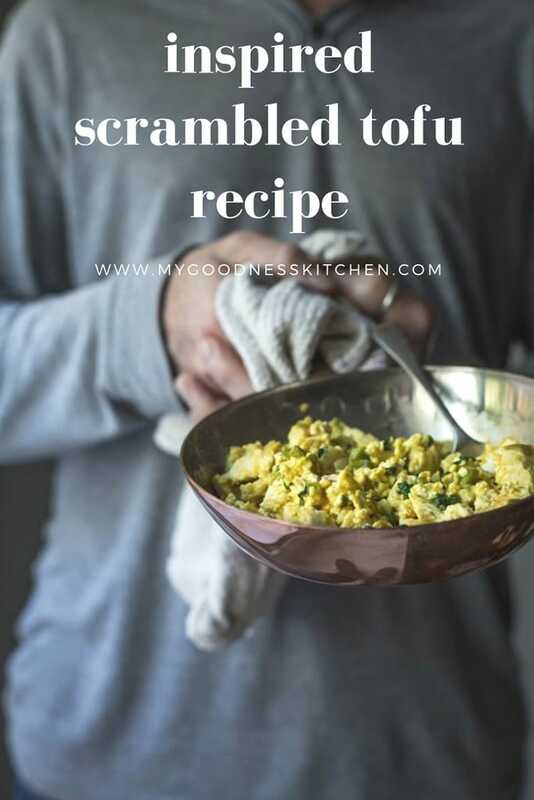 With pan-fried tofu, garlic and peppers tossed through a wonderfully creamy, cheesy sauce this Inspired Scrambled Tofu is the perfect partner to a rainy Sunday morning. Sunday mornings are one of the week’s little blessings that can pass you by in a matter of…well, hours. I love Sunday mornings; for a time it feels like the world has been put on pause and we can all breathe in an out and in and out again. Washing not done? Do it Monday, that’s what Mondays are for. Still in your jimjams? Who cares, you’re not going out anyway. This morning it rained and it rained and then it rained a little more. But inside our house it was toasty warm and just a little bit blissful. Sunday mornings beg for lazy breakfasts. 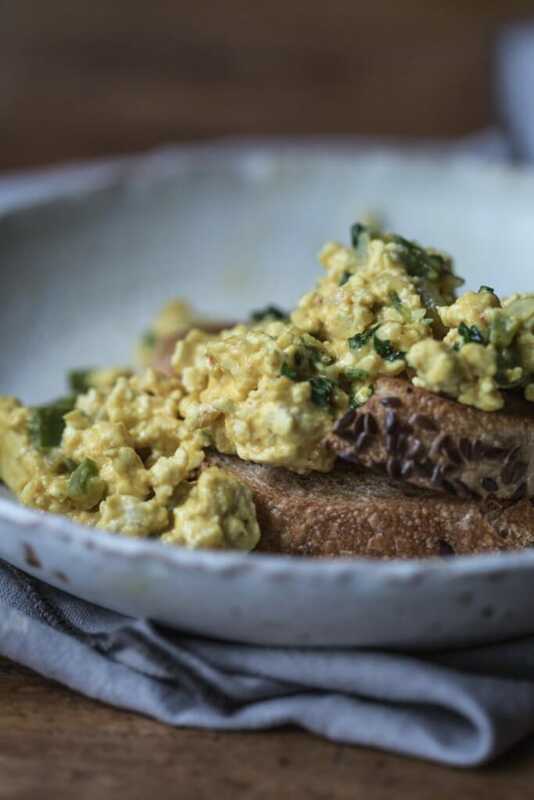 This inspired scrambled tofu is just the thing to kickstart a day of doing absolutely nothing of note. 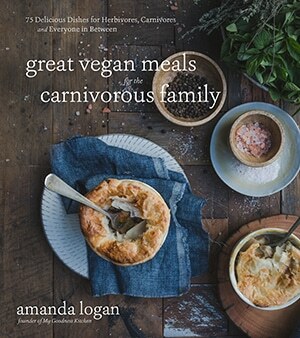 It is the perfect accompaniment to reading the paper or crawling back under the covers. 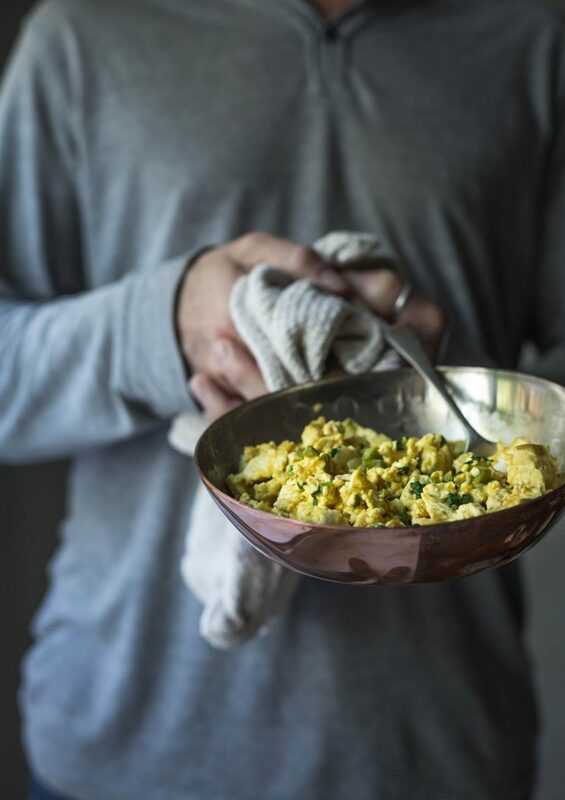 Scrambled tofu is one of the few dishes that our family eats together without any duress. The Husband doesn’t like eggs and has always ordered scrambled tofu at cafes, he just happens to have his with a side of bacon. Insert raised eyebrows [here]. The Elf eats her scramble, sometimes she doesn’t. As with all things Elf, it depends on which direction the wind is blowing or whether Mercury is rising. I am not sure of the science but I do know the odds are higher than average that she’ll eat her scramble especially with a heaping pile of fresh toast. Shannon and Mo from Smith & Daughters serve up a tofu that is a little bit spicy, a little bit creamy and utterly decadent. It is, dare I say, a little eggy. While the original recipe is buttery and rich, I have pared some of the ingredients back a smidge to create a slightly lighter version. It is still rich and wonderful just a little less buttery. I have included the original measurements in the recipe below for those that want to try it. While we hunker down to wait out the rain in a fort made of pillows, I am grateful for a few hours of nothing of note. 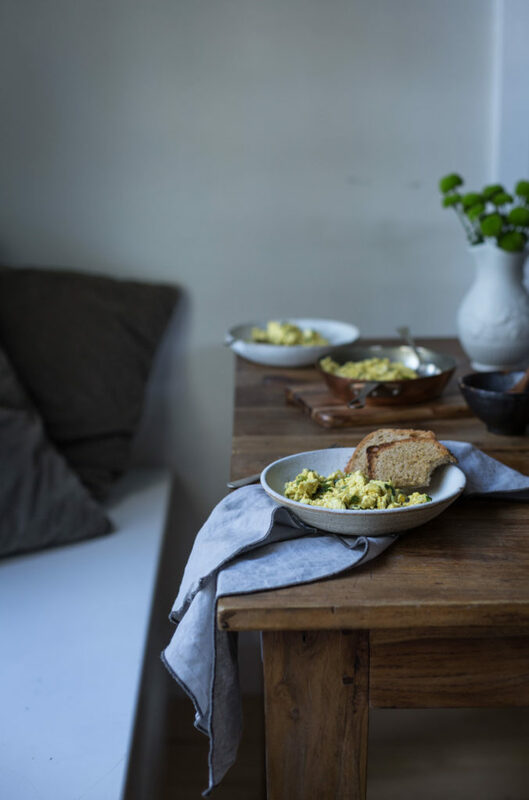 In no time the reality of a new working week will beckon but for now we have cartoons, pyjamas and a lazy breakfast of inspired scrambled tofu. There are worse things. Sigh. To make the sauce, combine the flour, spices, yeast and salt in a medium saucepan over low to medium heat. Add the stock while whisking. Continue whisking until the sauce begins to thicken. Turn the heat to low and add the dijon mustard and butter, stirring to combine. With the heat as low as possible, cook the sauce for 5 minutes, whisking often. Meanwhile to make the scrambled tofu, heat the butter and oil in a large fry pan. Add the onions and garlic with a pinch of salt and sauté until the onion is browned slightly. Add the peppers and/or jalapeños and cook for one minute. Crumble the tofu in to the pan and pan fry, without stirring until one side of the tofu is lightly toasted. Remove any excess liquid with a spoon. 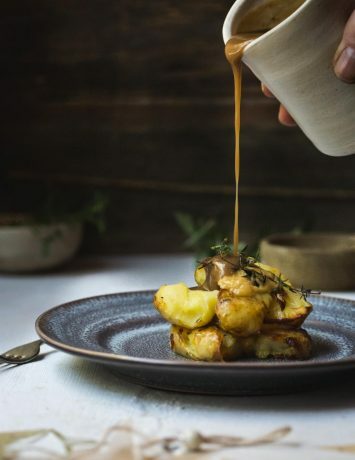 To serve, gently fold the tofu through the reserved sauce and add fresh herbs. If you find the sauce is quite thick, add a spoon of water and stir through before folding the tofu through. Do the peppers go in at the same time as garlic and onion? I am such a goose! I have amended the recipe. Add the peppers or jalapeños after the garlic and onion and cook for 1 minute before adding the tofu. Thanks Eleanor.